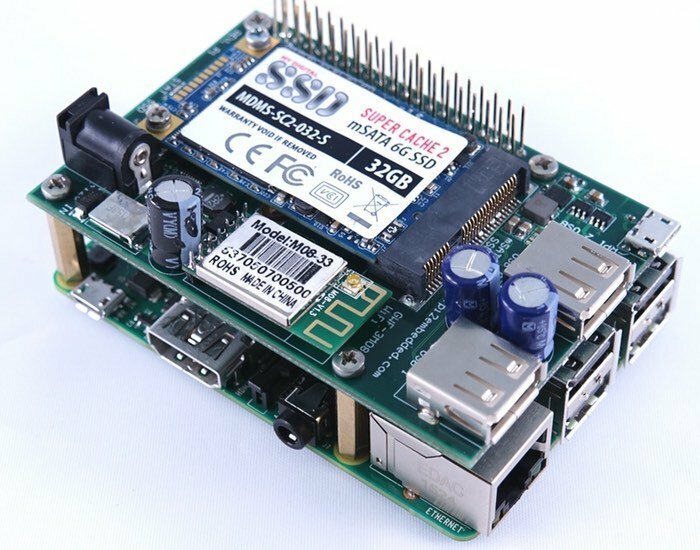 Raspberry Pi enthusiasts that would like to add extra storage to their Raspberry Pi 2 single board mini PC, may be interested in a new Raspberry Pi Shield that has been created by Pi 2 Design. – GWF-3M08 WiFi Module (Based on Ralink RT5370) provides 802.11b/g/n for up to 150Mbps. On-Module IPEX connector allows for optimal antenna placement. – DS1339 Real Time Clock with 16mm Coin Cell Battery Backup and Programmable Alarm. – 1-Wire DS18B20 Temperature Sensor mounted below SSD to monitor health of drive. – Additionally the DS18B20 has a unique 64-Bit ID that can be used to identify the shield. – On-Board Wide-Input 5V @ 5.5A power supply, powers all peripherals as well as the Raspberry Pi 2. In addition to the mSATA SSD Socket (up to 1TB) the CSB502SSD provides key functionality to the Raspberry PI 2. This includes: 802.11b/g/n Wifi with Soft-AP support and u.FL jack for optimal antenna placement; Dual USB 2.0 with 1A power; On-Board wide-input (8V-24V) power supply delivers 27.5W (5V @ 5.5A) of power to all on-board peripherals and the Raspberry PI 2; Real Time Clock with removable battery back up insures proper time keeping even with spotty or no network access; finally, the Temperature Sensor with 64-bit ID allows the CSB502SSD to monitor the health of the SSD and provide a unique asset tag. Jump over to the Kickstarter crowdfunding website to make a pledge from just $49 for early bird backers with delivery expected to take place during February 2016.